Johnson's first law office in Sacramento was located in a tent. Johnson once confronted J.E. Lawrence, editor of the Sacramento Times and Transcript, and accused Lawrence of writing an insulting article about him. When the editor refused to answer, Johnson grabbed Lawrence’s nose and twisted it in anger. The editor responded by drawing his pistol but onlookers were able to overtake him before he fired. Johnson's law partner, Ferris Foreman, was the 5th ex-officio State Librarian. William Neely Johnson, Johnson's brother, was the 2nd appointed State Librarian. As Governor he vetoed a bill because of its "bad spelling, improper punctuation and erasures," but he also holds the distinction of approving funding for the State Capitol. J. Neely Johnson was born in Indiana into a family of prominent Whigs. A national financial crisis, the Panic of 1837, ruled out Johnson’s plan to attend college; instead he apprenticed a printer. Before his apprenticeship was over, Johnson found a position with an attorney under whom he studied law. He left Indiana for Iowa were he was admitted to the bar at age 21. In 1849, Johnson migrated to California and arrived in Sacramento “dead broke.” His first job was hauling flour from Sacramento to Stockton for $16 a day. Johnson tried his hand at mining at Cook’s Bar on the Consumnes River for two months, but returned to Sacramento to open a law practice with Ferris Forman. Johnson's political career began on April 1, 1850, when he was elected Sacramento's city attorney. He was re-elected the following year. 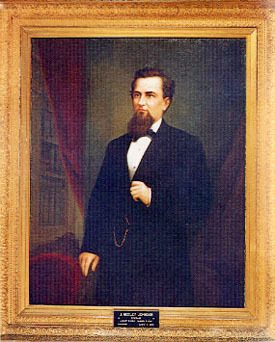 In 1852, Johnson was elected to serve as the Assembly member representing Sacramento. On January 9, 1856 Johnson took his oath as Governor–at 30, he was the youngest man ever to assume that office. He was described as "the most startled man in the state" when told of his election. Following his term as Governor, he engaged in mining activities and later practiced law in Carson City, Nevada. He served as the president of the second constitutional convention. In 1867, the Governor of Nevada appointed J. Neely Johnson to the state supreme court to fill a vacancy. He was elected to full term on the bench during the next general election. In 1872, Johnson returned to his law practice. J. Neely Johnson died at the age of 47 on August 31, 1872.